Tanaka Precious Metals precious metal plating processes help realize a safe and secure external environment for jigs and equipment parts, including corrosion protection, connections with external equipment and improved mounting reliability. Our strength in our integrated support of  stable sourcing of precious metal materials,  manufacturing of precious metal compounds used as sources of plating solutions,  manufacturing of metal plating solutions by EEJA, a Tanaka Precious Metals group company, and  using a plating bath capable of supporting large parts. Our wealth of knowledge is another of our assets. 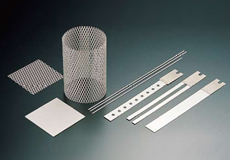 In addition, we also handle insoluble electrodes and platinum meshes as our plated products.